Prices are subject to change at any time. Orders will be invoiced at the price prevailing at date of shipment. We cannot guarantee prices for the life of our printed catalog, marketing materials, or website. All FactoryMation products carry the manufacturer’s warranty of at least one year, with many products carrying a warranty longer than one year. Products that are damaged or modified are not covered. See our Complete Terms and Conditions for complete Warranty Policies. If, for any reason, you wish to return one of our products, it must be unopened and unused, and a Return Material Authorization (RMA) must be issued within 30 days from order fulfillment. Fuses as well as special order, built-to-order, custom order, and value-add products are non-cancelable, non-returnable. Products may be returned for credit after completion of the required RMA procedure. All returns will be inspected upon arrival. Incomplete returns will prevent our team from properly processing the return and will be shipped back to you. Any and all products meeting the return requirements may be subject to a 20% restocking fee. The customer is responsible for all shipping fees associated with returns. Call, fax, or e-mail to request a RMA number and routing instructions. See our Complete Terms and Conditions for complete Return Policies. Same day shipping is available for orders placed up to 7pm ET. Orders ship from the stocking location that allows for best possible delivery. Orders placed by fax, mail, large quantities, or custom orders may take longer. All freight charges are paid in advance. Title and risk for loss transfer to the buyer upon delivery to the common carrier or pickup by the buyer’s agent. For certain heavy items, we use LTL (less-than-trailer load) carriers. LTL shipments are ‘prepaid and add’ transactions due at the time of invoice. Commercial locations without dock access, residential locations, or other limited access locations (as determined by the freight company) may incur additional fees for delivery, Additional services, such as Inside Delivery, Lift Gate, or Notification Prior to Delivery, and/or Residential delivery surcharge, may be required and subject to additional cost. All fees are the responsibility of the buyer. Shipments to Canada may be subject to additional customs charges and taxes. See our Complete Terms and Conditions for complete Shipping Policies. Free shipping options are available online for small package shipments ($29 minimum order required) and LTL shipments ($500 minimum order required). 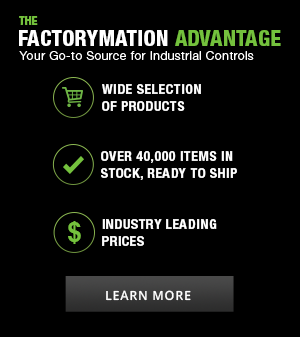 Free shipping, when offered, is available only to destinations within the contiguous United States (excludes Alaska and Hawaii) and shipped best/most economical way at FactoryMation’s discretion. We reserve the option to consolidate items for shipment and select the common carrier and shipping methods (small package and LTL). Time-specific delivery and/or service options are available for an additional charge. Call for critical delivery requirements. Delivery locations that require addition al services (as determined by the freight company) such as Inside Delivery, Lift Gate, or Notification Prior to Delivery, and/or residential delivery surcharge, may be required and subjest to additional cost. All additional service fees are the responsibility of the buyer.